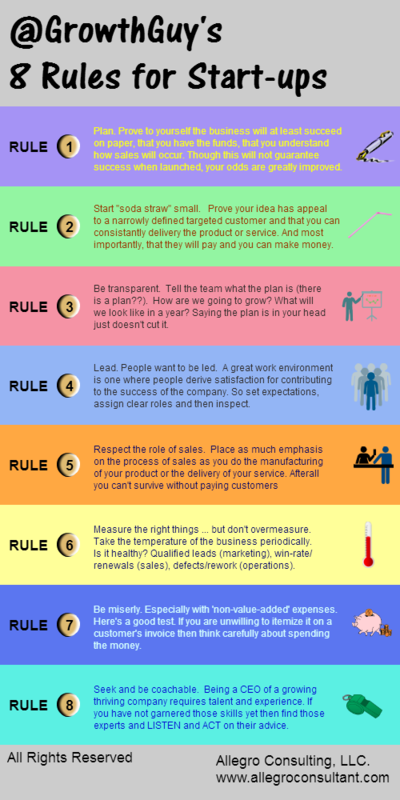 8 Rules for Startups - from 14 yrs. of Business "Accident Investigations"
1. Plan it on paper first. 2. Start ‘soda straw’ small. “I want to sell our solution to lawyers.” “I want to provide our services to any tech startup.” “This new CRM solution is for ANY small business.” These are real examples from start-up founders who each had a minimal sales force. The problem with this approach is the size of the customer target dwarfs the typical staff and resources available to communicate with this audience in any meaningful concentrated manner. The more effective approach is to carve out a narrow segment of the target demographic (by geography, specialty, etc...) and concentrate your resources accordingly then prove your business model can succeed with that segmented customer. Then, and only then, grow by pursuing new customer demographics in “one vector off “ increments. Tell the team what the plan is (there is a plan - right? ), who are the competitors, why are we different, how are we going to grow, what the company can/will look like a year from now, and how will we make that vision a reality. Saying that the plan is in your head just doesn’t help anyone. Worse than that, keeping the plan a ‘secret’ provides for the use of that number one of all excuses when goals aren’t met, “I didn’t know.”. People want to be led. That is a fact. A great work environment is one where there is personal satisfaction for directly contributing to the growth of the company. I heard from one CEO of a Fortune 100 company that his leadership style was to “set expectations then inspect”. Perfect and succinct. So lead by assigning clear roles and responsibilities, set measurable expectations then inspect to ensure your plan is being followed and the team is getting the support, training and resources they need to do their jobs. 5. Have a sales process. 6. Measure the right things. But don’t over measure. Taking the temperature of the company is important to gauge it’s health and how well your team is performing to the plan (there is that word again!). Here are a few of my favorite things to measure: qualified leads (marketing), win-rate/renewals (sales), defects/rework/on-time delivery/production cost (operations), operating cash flow (finance). 8. Seek out advice and be coachable. Being a good lawyer doesn’t automatically mean you have the experience to be the CEO of your newly formed law practice. Same thing holds for a gaming coder, software developer, or a doctor, engineer, or a chemist. And lastly just because it was your idea or invention doesn’t mean you are equipped with the skills to lead and grow a company. Sad to see an owner finally grasp, “You mean the problem is me?” just before the business is shuttered. Worse is everyone around him/her already knew this. Running a growing thriving company is hard and requires talent and expertise. If you have not gained that expertise through varied job experiences then seek out those experts and LISTEN and ACT on their advice.